Car-free living has officially reached trend status. Last week, the New York Times ran an interesting and evocative story about the increase in people choosing to live without a car. Perhaps it’s a trend that’s been building. 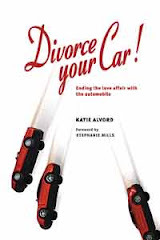 Nearly a decade ago, shortly after Divorce Your Car! first came out, I got a call from a Time magazine writer wanting to know about this same trend. Were more people, in fact, going car-free? At the time, Critical Mass rides had become a phenomenon, and a surge of transportation reform groups had drawn attention to the need to cut car use. Still, it was hard to tell how many people might be choosing a car-free lifestyle, and ultimately, the magazine did not run an article. For last week's piece, NYT reporter Micheline Maynard dug up several numbers that serve as proxies for the car-free trend. Her article notes that young people now wait longer to buy a first car. She also quotes Jesse Toprak of TrueCar, a company tracking car-buying trends; the data Toprak has seen suggests suburbanites are down-sizing from three cars to one or two per household. Maynard also cites Toyota’s finding that in at least 60 U.S. locations, more people have moved into city centers and gotten rid of their cars. We already spend thousands per year on cars, but as gas prices have gone up and economic prosperity down, more people have indeed realized that cutting back on driving and car ownership can save big chunks of money. Growing awareness of climate change has sparked a new wave of environmental advocacy, and awareness of the problems caused by all our driving – enough to inspire more people to cut back. A shift in U.S. transportation funding that started with ISTEA in the 1990s has had more time to give us better facilities for walkers, cyclists, and transit users. Congestion continues to be a problem, as tracked by the Texas Transportation Institute, and who needs it? Especially now that we have a few more alternatives to driving. With the better facilities mentioned above, it’s now more convenient in more places to go car-free. Movements like Smart Growth and various livable communities initiatives have also had more time to promote and help establish denser and more walkable, bikeable and transit-friendly cities and towns. The cutting edge – what Maynard calls “a fledgling car-free movement emerging in big cities like New York, Boston and San Francisco that echoes a much broader campaign in Europe and Asia” -- has actually been around for awhile, and has had time to strengthen and gain more influence. New York City’s own Transportation Alternatives was founded in 1973. Next year, the World Carfree Network will host the ninth Towards Carfree Cities Conference since these conferences began in 1997. How would you answer the question? 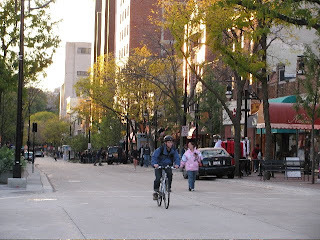 What’s changed between 2000 and today that has fed the trend toward more car-free living? I welcome your comments.